Below we have listed all of Pekić's fiction and non-fiction books in chronological order and with the English titles. Although translated in 14 languages many are not yet available in English, but we are working hard to change that in the near future and will update here as they are published. As far as the question of genre is concerned, please read further below The Third Culture. The success of Pekić's fictional work in particular, is due in large part to his ability to interlace page-turning plots, driven by fascinating and complex characters, with academic acumen in the fields of philosophy and anthropology, as well as history. 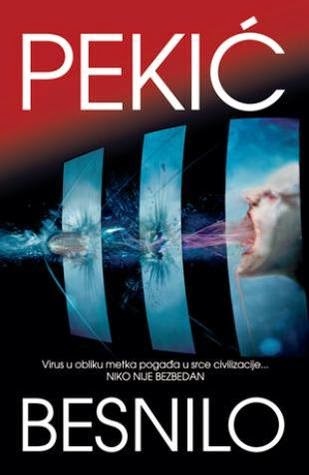 And this allows Pekić to pull off a very rare feat: to entertain us with a gripping story and simultaneously invite us to join him on his intellectual journey, examining the central philosophical ideas ranging from their pre-Socratic beginnings all the way to the still unsolved problems in philosophy today - "What is the meaning of life? ", "Where did we come from? ", "What is reality?" - through an anthropological lens. To better understand and appreciate this interplay of History, Philosophy and Anthropology in Pekić's novels, we recommend his lecture, "The Historical Novel and the Historical Reality" held in 1984 at the UCL in London ("Istorijski roman i istorijska realnost"), in which he surprised his audience by naming 1984 as "one of the best historical novels ever written". The second example, of course, will arouse your surprise. It is George Orwell's 1984, the year through which we think we are passing. I say think, for in its essential meaning, we have in fact already past through it long ago, and the futuristic, negatively utopian form of the work which has deceived readers and critics alike, is in fact the artistic mask for one of the most perfect metahistorical novels of all time. For the basic condition which characterizes the society of Orwell's pseudo-future, is that of Doublethink. And Double-think is the content of the whole of human's history, from that very moment when mankind, at the dawn of consciousness, through the invention of the first tool, the innocent, and useful primeval forbear of our present-day atom bomb, once and for all set out along the path of the lower, but easier materialist alternative of life, leaving behind only double-think excuses for the spiritual one. This our civilization would not be schizophrenic if we were not aware of the mistaken nature of our choice. To overcome that awareness, which would have made history nonsensical for us in advance, we had to forget that this spiritual alternative and the possibility for it ever existed, and then forget that we had forgotten about it. We managed to achieve this by the complicated system of Double-think in the different areas of human life of human awareness. In the work of organizing The Global Lie which would quickly take over both the destiny and the history of mankind, there came together rationalistic ideas of progress, the deterministic cults, the various philosophies of so-called needs, and in the historical field, social utopias and pseudo-humanist doctrines. I see my work on the historical novel in a spiritualist way, and not an historiographical one. The bringing to life of history is a work of magic, not of science. Facts are make-up. Make-up makes a face more visible, but it does not create it. If a writer does not have the motto of resurrection, "Arise and walk!" – he will achieve animated, but not real life, a corpse which moves but does not live. It will look like the past, perhaps, but it will not be the past. There are a lot of those who know how to dig up a corps from the grave of the past, but only a very few who know how to summon up its spirit. I should like to be amongst these latter. But for that one probably has to be a medium, not a creator. It is probably necessary to give oneself over hypnotically to signals from 'the other side', to prophesy backwards, to purify oneself of the layers of prejudice and experience – one and the same thing – which have separated us from the past, in short, to become once more – innocent. Only time will show whether I shall succeed. 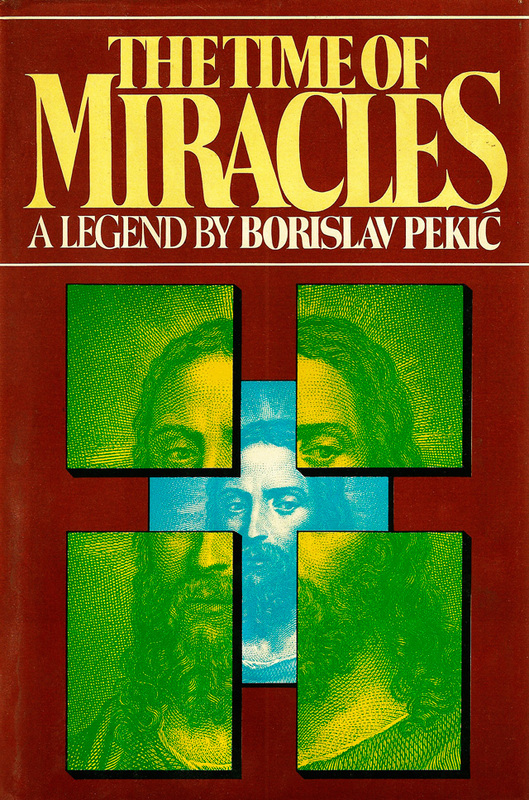 When Borislav Pekić's first novel, "The Time of Miracles", was published in 1965, it became an overnight sensation. A set of parables based on the miracles of the New Testament, the book rewrites the story of Jesus from the perspective of Judas (who is obsessed with the idea prophecy must be fulfilled) and from that of the individuals upon whom miracles were performed--without their consent and subsequently very much to their horrific detriment. Filled with humor and poignancy, The Time of Miracles is a trenchant commentary on the power of ideology in one's life, upon what it means to hold beliefs, and upon the nature of faith. Prosveta, Belgrade, 1965, 1983. Narodna knjiga, Belgrade, 1997. Grafički zavod, Podgorica, Montenegro, 1969. Solaris, Novi Sad, 2006. Partizanska knjiga, Belgrade, 1984, in "Borislav Pekić's chosen works" in 12 volumes. Prosveta, Belgrade, 1991, in "Borislav Pekić's selected works" in 6 volumes. New Writings in Yugoslavia, ed., Bernard Johnson, Penguin, London, UK. French - "Le serpent a plumes", Paris, 1996, trans. by Mireille Robin. Arsenije Njegovan’s portrait through his obsessive love towards houses which are in his possession. He is able to fall in love with buildings as if they were humans. Symbolically the houses here are a metaphor for mens' yearning for property and beauty. From 1941 to 1968 Arsenije is isolated from the world in his home. The first time he ventures out is in 1968 just at the time of the student’s anti-government demonstrations. There he lands into a fight with the radicals, gets beaten up, and returns home where he writes his testament and dies. With cutting irony Pekić provides a brilliant insight into a mind possessed by a single passion: the love for buildings – the houses of Belgrade. Pekić says: “To enliven history is a work of magic, not of science. The task of literature is not merely to portray an epoch, but to imaginatively resurrect, revive its spirit in a way in which the contemporaries, the protagonists of our historic novel, have experienced it (not we in their place)”. Portrait. - Prosveta, Belgrade, 1970, 1971 and 1991. NIN Award for the best novel of the year in 1970. Nolit, Belgrade, 1981. Partizanska knjiga, Belgrade, 1984, in "Borislav Pekić's chosen works" in 12 volumes. Prosveta, Belgrade, 1991, in "Borislav Pekić's selected works" in 6 volumes. Zavod za udžbenike, Belgrade, 2002. NIN and Zavod za udžbenike, Belgrade, 2004. Evro-Gunti, Belgrade, 2010. Translations: English - Harcourt Brace Jovanovich, New York, 1978, "The Houses of Belgrade" trans. Bernard Johnson; English - Northwestern University Press, Evanston, Illinois, 1994; Polish – Panstwowy Institut Wudawniczy, Warszawa, 1985, trans. Orzegorz Latuszynski; Czech – Odeon, Praha, 1985, trans. Josef Hlavnicka; Rumanian – Editura Univers, Bucuresti, 1985, trans. Voislav Stoianovici. This fictional story is part of a trilogy treating different ways of collaboration. The novel tells us about an ice skating artist in the time of the German occupation of Serbia. Icarus wishes to accomplish his lifelong ambition, the need to be godlike, aspiring towards perfection, to compete with the Greek god Hellion. He is a genius on ice, proud of his art where he reaches the zenith by his glorious, almost unnatural jumps, contesting with the sun. He falls on the ice of human reality and breaks his spine. Pekić had thus transposed the legend of Icarus, as a tragic account of human vanity, that repeats itself at all time, and he permeates the Greek myth with a modern content. Slovo ljubve, Belgrade, 1975. Partizanska knjiga, Belgrade, 1984, in "Borislav Pekić's chosen works" in 12 volumes. Prosveta, Belgrade, 1991, in "Borislav Pekić's selected works" in 6 volumes. Translations: Polish - Czyletnik, Warszawa, 1980, trans. Elzbieta Kwasiwska; Hungarian – Europa, Budapest, 1982, trans. Poor Zsigmond; Czech – Odeon, Praha, 1985, trans. Josef Hlavnicka; French – L’ Age d’ Homme, Lausanne, 1992, trans. Mireille Robin. Laguna, Belgrade, 2013. Slovo ljubve, Belgrade, 1977. Partizanska knjiga, Belgrade, 1984, in "Borislav Pekić's chosen works" in 12 volumes. Prosveta, Belgrade, 1991, in "Borislav Pekić's selected works" in 6 volumes. Translations: English - Northwestern University Press, Evanston, Illinois, 2011, trans. Bojan Mišić; Polish; Hungarian - Europa, Budapest, 1982, trans. Poor Zsigmond; Czech – Odeon, Praha, 1983, trans. Jirri Fiedler; French – L’ Age d’ Homme, Lausanne, 1990, trans. Harieta et Francis Wybrands. Laguna, Belgrade, 2013. Third part of Pekić’s trilogy about collaboration. Here the protagonist tries to find a modus vivendi with his Nazi past, either to redeem it or to lay it to rest. A narrative written in epistle form, in which the leading character has a polemic dialogue with an invisible correspondent, a deadly trial with history - the principal culprit for his moral and spiritual disintegration. It explains the genesis of a totalitarian mentality, and at the same time shows the destruction of Nazism and similar forms of myths and ideologies. The writer demonstrates how there are no small compromises, and that in the end the small ones are, because everything evolves from them, really the most dangerous. The letters are written by a former SS officer, who later becomes a professor of medieval history, and the correspondence demonstrates his participation in the occupation of the Balkans. United Belgrade Publishers (Bigz, Rad, Narodna knjiga) Belgrade, 1977. First prize from the United Belgrade Publishers. (First version in Stvaranje, 1972, under the title “The Death and Transformation”.) Partizanska knjiga, Belgrade, 1984, in "Borislav Pekić's chosen works" in 12 volumes. Prosveta, Belgrade, 1991, in "Borislav Pekić's selected works" in 6 volumes. Translations: Czech – Dilia, Praha, 1980, trans. Irena Wenigova; Slovene – Mladinska knjiga, Ljubljana, 1981, trans. Ferdinand Miklavc; Polish – Wydawnictwo Lodzkie, Lodz, 1985, trans. Magdalene Petryriska; Italian – De Martinis & Co, Milano, 1992, trans. Alice Parmeggiani. 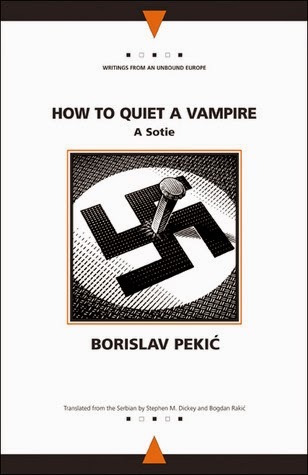 English translation by Bogdan Rakic & Stephen M. Dickey, How to Quieten a Vampire, published by Northwestern University Press, Evanston, Illinois, in autumn 2002. Laguna, Belgrade, 2012. This phantasmagoric novel and Pekić's masterpiece describes a Tzintzar family from Moskopolje, and by way of this clan, a subjective and historical vision of Belgrade and the Serbian bourgeois class. The time in the story unfolds not in a linear but in a circular fashion, from the imaginary start at Moskopolje in the year 1769, proceeding parallel into the “past” and “future”. It progresses backwards in the past to the fall of Constantinople in 1453, and into the future to Buenos Aires in 1980, positioning the years 1453 and 1980 at the same space level, and then swallows it all like a “black cosmic hole” - into the timelessness of the Eleusinian mysteries. At that same moment the carrier of the family’s consciousness, Simeon Njegovan, the Boss, is dying, achieving eternity in the only possible way for a human being. The past, the present and the future are simultaneous zones of temporality, and the journey through time is treated just as an illusion. “The whole saga of The Golden Fleece depends upon the principle of understanding time”, says Pekić. The constant credo of this family’s odyssey is the desire for possession, giving it the highest meaning - the will for ownership. The novel is a syncretic polyphony about the eternal search for the Golden Fleece of Life. In the final phases it explores the prehistoric mythical roots of our civilization, of the Pelage and the Palaeobalkanic era, were there where no boundaries between the possible and the impossible. It is an analysis and a critique of our materialistic civilization, our rationalistic views on life, founded on possession and possessiveness, as well as the morality, which evolves from it. The narrative is linked to its appropriate time, and through differences and analogies, the author tries to decipher mythology as the quintessence of human history. It shows an imaginative resurrection of the past, the revival of its spirit in the way in which its contemporaries, the characters of this historic saga, have experienced it. This is not only a history of the family Njegovan, of Belgrade, the Serbs and the Balkans, but also an artistic way of showing the anthropological history of the Birth of European civilization. From the imaginary beginnings men renounced the higher possibilities of humanity, contained in the spiritual alternative, of which the Argonauts’ voyage to the East to get the Golden Fleece of Life, is only a mythical metaphor. “The whole book is in essence a transcript of the Orphean myth. In The Golden Fleece I maintain the belief that the myth is a form of existence and vision, and not exclusively of perception”, says Pekić about the novel. volumes 1-7. Phantasmagoria. - Prosveta, Belgrade, 1978-1986. 1-5 volumes were published by Partizanska knjiga, Belgrade, 1984, in "Borislav Pekić's chosen works" in 12 volumes. Njegoš Award 1987. Dereta's leather-bound collector's edition of the seven volumes came out during 2005 and 2006. 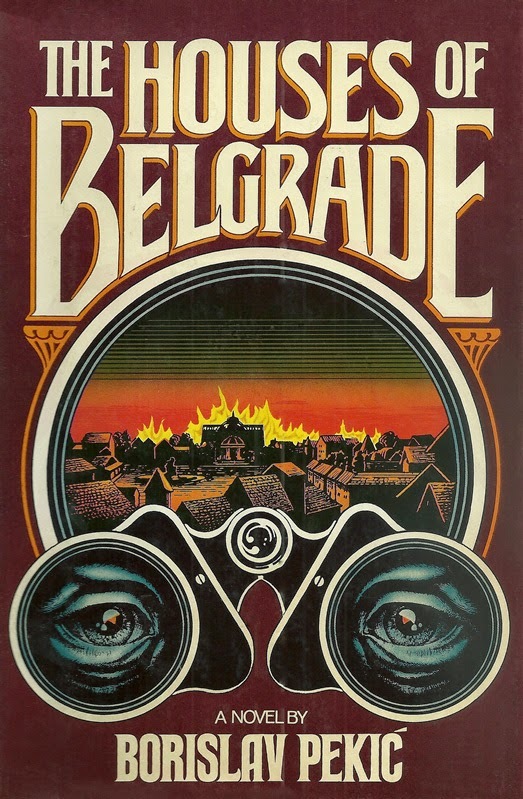 Selected as the best Serbian novel between in 1982 and 1992. Translation into French: Agone, Editions Marginales, Paris, trans. Mireille Robin.1st volume, published in January 2002, 2nd volume, in 2003, and 3rd volume in 2004. Laguna, Belgrade, 2013. Rabies is a vision of the world’s end, which somewhat justly corresponds to that which we, in our anthropocentric vanity, have made of it, since nature has leased the planet to us only temporarily. The novel displays a microbiological catastrophe that occurs because of a recombination of the rabies virus in a scientific laboratory. Tearing off the petit bourgeois masque of pity from his characters, Pekić demonstrates how people are ruthless in their rage, especially when they find themselves in trouble, and have to save their own lives. This apocalyptic thriller deals with mankind as well as with the nature of our civilization. It is a science fiction drama with a number of parallel stories, and it all happens at London Heathrow Airport with a catastrophic end. It has different levels in which it could be read, with a philosophical and even a religious message. Sveucilisna naklada Liber, Zagreb, 1983. Award “Belgrade conquerors”. Prosveta, Belgrade, 1991, in "Borislav Pekić's selected works" in 6 volumes. Laguna, Belgrade, 2011. Translations: Spanish – "La rabia", Grupo Libro, Madrid, 1988, trans. Luisa Fernanda Garrido; Slovene – Drzavna zalozba Slovenije, Ljubljana, 1992, trans. Ferdinand Miklavc; Hungarian trans. Endre Bojtar. Laguna, Belgrade, 2011. Book 1-12, Partizanska knjiga, Belgrade, 1984. Award from the Union of Serbian Writers. The Defense and the Last Days of Andreja Gavrilović. 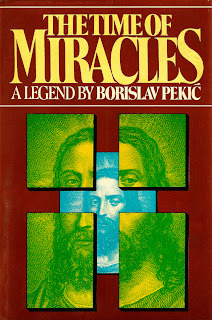 Forewords by: Nikola Milosevic “Borislav Pekić and His “Mithomahy” and Borislav Pekić “The Myth of Literature and the Myth of Reality”. Book 2 - The Time of Miracles. Book 3 - The Pilgrimage of Arsenije Njegovan. Book 4 - How to Quieten a Vampire. Book 5 - The Golden Fleece, part 1. Book 6 – The Golden Fleece, part 2. Book 7 – The Golden Fleece, part 3. Book 8 – The Golden Fleece, part 4. Book 9 – The Golden Fleece, part 5. “The Generals or Kinship in Arms”. Book 12 – "There Where the Vines Weep" – essays, diaries. 19. “’Black Marketers’ or how I have understood that the Middle Class Has Been Attacked by Mildew”. Second part: The Bourgeois, a Reformer or an Outsider – (essays). 28. “In the Search for the Bones of Resurrection or About the Sacred Alliance of Science and Crime”. 30. “Invitation to a Dialogue”. 37. “Finally One Shadow of New Belgrade”. Afterword: “Borislav Pekic, an excerpt for a portrait” by Borislav Mihajlovic Mihiz. Book 1-12, Partizanska knjiga, Belgrade, 1984. Afterword: Petar Pijanović, "Prose of Borislav Pekić"
Anthropological tales depicting our world at different stages of development. Five stories about five civilizations, five human alternatives, which are separated by millions of years. In the first story (“The Golden Countryside”) the catastrophe is happening in 1999, in spite of the late demonstration of a spiritual alternative. The second story (“New Jerusalem”) tells us about the consequences of 1999. Through the history of the Second mutant civilization, which consists of isolated and self-sufficient, mentally completely different individuals, served by robots, whose brilliant representative, an archaeologist, finds a comforting alternative to this individualistic world; in the ice of the North, on the grounds of an old Siberian concentration camp, which he, by faultless logical and scientific means, explains as an ideal concept of society. In the third story (“The Last Man on Earth”) the last human dies, the consequence of 1999, the last mutant on earth, who on his own represents the Third civilization; he has all the required alternative, spiritual, even occult powers – he can through pure energy “move mountains” – but without being able to use them for anything useful, since except for him there is not a living soul in the world. Robots, animated biological copies of men, and the inhabitants of the Fourth civilization inherit the earth, but in view of their lifeless nature, they are completely adapted to the materialistic civilization, against which the lifegiving environment has fought in vain. In the fourth story (“The Divine News”) about the Fourth civilization, the year 1999 approaches once more, as if for mysterious reasons the first story is repeated again; but this is an illusion, as is everything in that story, since the time is different. Only the humane history repeats itself. In the fifth story (“The Sixth Day”) the year is 1999, and again it’s the 6th July, and again 17:30 in the afternoon, but the time is different. In this Fifth civilization, in a world of absolute necessities, suddenly, paradoxically, the famous year 1999 and Nostradamus’ prediction doesn’t come true. In the end, in the sixth story (“Interlude”) some sort of post-script, there is a possibility that in some future time, in some year 1999, at last the First man will be born. All forms of human existence that our species had tested have always led to the same end – our self-destruction, as if it was written in the basic human code. Anthropological narrative. - Cankarjeva Založba, Ljubljana, 1985. Laguna, Belgrade, 2011. Award for the best science fiction novel. These are Pekic’s memoirs in three volumes, with an account of the post revolutionary days, and the life of the bourgeoisie under communist rule, their persecutions, particularly in Belgrade. The author has been arrested as an eighteen-year-old student, being the political secretary of an illegal organization, The Union of Democratic Youth of Yugoslavia. He was sentenced first to ten and after the appeal to 15 years imprisonment with hard labor. The first volume deals with the interrogation in 1948, the second is about the trial, the third describes his time in jail till the end of 1953. The account is not purely autobiographical in the classical sense, since the author talks also about the way people lived after the Second World War in Yugoslavia. He depicts prison life as an unique civilization, and the civilization of freedom, at that time in Yugoslavia, as a special prison. The theme is the time and the way people were thinking and behaving, its spirit, the events which illustrate the era, as well as the destructive consequences which communism has had on the urbane classes in Belgrade. In Pekic’s words: “In The Locusts … I am not the subject, neither are the people who shared my views. The topic is the era”. The three volumes enfold the destiny of other inmates and prison life in general, not only in Yugoslavia, but also in the world. The circumstances are described with a detached view, often with humor, which makes the topic interesting and exciting to read. Anthropological narrative. - Cankarjeva Založba, Ljubljana, 1985. Volume 1, 2 &3. Reminiscence from Prison (1948-1954) or An Anthropological Epic. - Bigz, Belgrade, 1987-1990. Foreword by Borislav Pekic: “Returning to Prison or The Sandman’s Diary”. According to an opinion poll of two daily newspapers, the first volume was selected as the best Yugoslav publication in 1987. The second volume received the award “Miloš Crnjanski” as Best Memoirs in 1989. Službeni glasnik, Belgrade 2010. Laguna, Belgrade, 2013. Translations: Two extracts have been translated into English: “Interrogation or Self-interrogation /1948-1949/”, Passport, Huntingdon, 1993, trans. Christina Pribichevich-Zoric; “Resistance and Comforts”, Leopard III, London, 1994, trans. Ellen Elias-Bursac. This 7th volume of The Golden Fleece, is printed as a separate book, since it could be read independently from the previous six, although it represents the climax of the epic. It depicts the voyage of Simeon Nago, the founder of the clan, with the Argonauts in search of the Golden Fleece of Life. In a way it is the beginning as well as the end of the saga. In it emotionality and spirituality surrender to the myth, to its philosophy, to the more profound mysteries and implications of life. The theme is given in allegories and everything is a symbol. Here we have the key for all six preceding volumes and only with this key could we understand the higher level of meaning, which was the reason for writing The Golden Fleece in the first place. “This volume is a reflection, in fact my thoughts transformed into visions, or better - into pictures, with the hope that the reader will read it as thoughts. Noemis found the real Golden Fleece by committing himself to human history, and going through mankind’s inferno. In The Golden Fleece I have established the myth’s power over history and over human’s destiny”, says Pekic in his diaries. As a part-time commentator for the BBC World Service, the Serbo-Croat Section, London, (1986-1991) Pekic read his “Letters from London” every week and subsequently they were printed. The publication consists of 50 letters, which have witty and inventive observations about England and the English people, covering different subjects and events. The letters were broadcast for listeners in Yugoslavia, therefore Pekic made also numerous comparisons with the government, the country and the characteristics of the people in his fatherland in a humorous way. “If it is good, our life loses a lot if it isn’t lived at the right place, but the right place is only the one where we were born and grew up. Of all the foreignness to which we are condemned, the most bearable is still our own’, says Pekic. Nakladni zavod Znanje, Zagreb, 1987. Foreword by Borislav Pekic: “A Letter to the Reader”. "Sabrana pisma iz tuđine", Službeni glasnik, Belgrade, 2010. At first sight a thriller, but in fact an anthropological fantasy – a global vision of mankind’s past and future. Our civilization is basically depicted as an android and not a human history. The false lifestyle which we lead is only an imitation of life, created by androids, and it is thus impossible to enjoy genuine life. A war starts for a humanitarian existence, a fight between the robot majority and the human minority, who are the survivors of the sunken Atlantis. The story delivers the idea of our pseudo life, a synthetic existence, a phantasmagoric reality in which we live. It shows the fate of humanity, which has developed in this way because of the all-embraced materialism, the mechanization of life, and foremost by reason of the automation of our life, in the real and figurative meaning. It shows the alienated models of behavior, a false and misleading history, which has been developed from the beginning. The robots lose this war, but at the same time mankind also lost, since the people from Atlantis had to use ignoble means to win the fight. 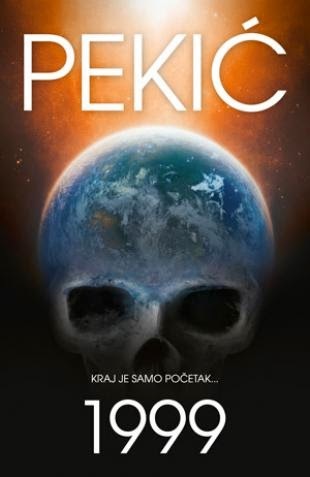 According to Pekić: “The novel Atlantis should be perceived as a global metaphor of the history of our species”. Epic. Vol. 1 & 2, Nakladni zavod Znanje, Zagreb, 1988. “Goran” award. Laguna, belgrade, 2011. Five stories create this Gothic chronology. The first: “Megalos Mastoras and His Work, 1347” takes place in Byzantium during the plague of the 'Black Death'. The second: “The Imprint of a Heart on the Wall, 1649” depicts an event from British history. The third: “The Man who Devours Death, 1793” is happening at the time of Terror during the French Revolution. The fourth: “The Fiddler from the Golden Time, 1987” is located in Belgrade. The fifth: “The Fire of New Jerusalem, 2999” is a projection into the future. Each story has as the fundamental idea one Element – Fire (the first), Earth (the second), Water (the third), Air (the fourth), Metal (the fifth). All the narratives try to reach an answer as to the quintessence of life and to find responses to some basic queries about humanity from a viewpoint of the time in which the story is located. What is common in all these tales is a deep resignation and helplessness of man in getting valid answers in response to basic questions. The chronicle indicates Pekic’s view on mankind’s history, past as well as the future, as an account of powerlessness, ignorance and misunderstandings. Gothic narrative. - Nolit, Belgrade, 1988. Prosveta, Belgrade, 1991, in "Borislav Pekić's selected works" in 6 volumes. Translations: one story published in French: L’homme qui mangeait la mort, Editions du Titre, 1988, trans. Mireille Robin, which won The Best Book of a Foreign Author in September 2005 on 'France kulture'. Another story was translated into English in The Prince of Fire. An Anthology of Contemporary Serbian Short Stories. ed. Radmila J. Gorup amd Nadezda Obradovic with a foreword by Charles Simic. Pittsburgh: University of Pittsburgh Press, 1998. Translated by Bogdan Rakic and Stephen M. Dickey: "Megalos Mastoras and His Work, 1347 AD”, pp. 17-53. Translation into Greek of the book is in progress. As a part-time commentator for the BBC World Service, Serbo-Croat Section, London, (1986-1991) Pekić read his “Letters from London” every week. Subsequently they were published. This second volume is a continuation of the first - Letters from Abroad and consists of further 50 letters, which have new witty and inventive observations about England and the English people, covering different topics and episodes. They were broadcast for listeners in Yugoslavia, consequently he made numerous comparisons contrasting Great Britain, the British, with the government, history and the characteristics of the people in Yugoslavia in a humorous way. In one place Pekic says: “If it is good, our life loses a lot if it isn’t lived at the right place, but the right place is only the one where we were born and grew up. Of all the foreignness to which we are condemned, the most bearable is still our own”. Nakladni zavod Znanje, Zagreb, 1989. Foreword by Borislav Pekic: “Second Letter to the Reader”. "Sabrana pisma iz tuđine", Službeni glasnik, Belgrade, 2010. Award “Jasa Ignjatovic”, Sent Andrea, Hungary. 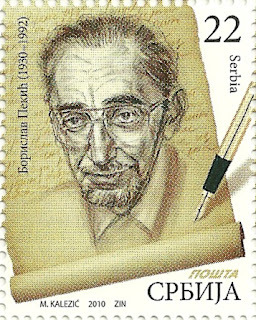 As a part-time commentator for the BBC World Service, Serbo-Croat Section, London, (1986-1991) Pekic read his “Letters from London” every week and they were published afterwards. This third and last volume is a continuation of the previous ones and consists of further 50 letters, which have original, humorous and inventive observations about England and the English people covering different contents and happenings. It was broadcast for listeners in Yugoslavia, therefore he made also numerous comparisons between Great Britain, the British, and the government, history and the characteristics of the people in Yugoslavia in a humorous way. Pekic also says: “If it is good, our life loses a lot if it isn’t lived at the right place, but the right place is only the one where we were born and grew up. Of all the foreignness to which we are condemned, the most bearable is still our own”. Dereta, Belgrade, 1991. Foreword by Borislav Pekic: “Letter to the Reader” and “The Third and Last Letter to the Reader”. Notes about the author. Yearly award publishing house of Dereta. "Sabrana pisma iz tuđine", Službeni glasnik, Belgrade, 2010. Pekić’s articles move through history in an interesting and polemic way. At the center of his attention is the British Empire from the earliest days to the life of the British people during the Second World War. English history is perceived also through events and history of other European countries and countries worldwide. The circumstances are analyzed in comparison with the history and people of Yugoslavia. As a part-time commentator for the BBC World Service, Serbo-Croat Section, London, he broadcasted this account of British history once a month, in the period 1990-1991, for listeners in Yugoslavia. Subsequently, with some amplification, Pekic prepared it for publication. The text was printed posthumously. Bigz, Belgrade, 1992. Službeni glasnik, Belgrade, 2010. Yearly award publishing house of Bigz. A collection of interviews with Pekic, that leads the reader into the world of the writer’s thoughts and intentions, into the core of the atmosphere in which the artist creates and conceives his work. It was published posthumously, selected and assembled by Bozo Koprivica. Through these interviews Pekic interprets his opus, gives answers to crucial questions about ideas and the philosophy of his novels, analyzes his thoughts on people, politics, literature and humanity as a whole. Included are bibliographical notes about the interviews, a selection of Pekic’s bibliographical notes, his published and translated dramas and literary work. Bigz, Belgrade, 1993. Selection and foreword by Bozo Koprivica: “A Remark or Reminiscence”. Epilogue by Bozo Koprivica: “Megalos Mastoras”. Notes about the author. A collection of Pekic’s political and ecological essays, articles and speeches, compiled and selected by Radoslav Bratic. It is a publication that shows his talent not only of courage, doubt and irony, concerning the lies and problems in our society. As a very stern critic of every type of suppression and totalitarianism, but also of all systems of power which rule our ravished and contaminated planet, here are his ideas and thoughts, reflections and observations. Some of his speeches at opposition meetings are published here for the first time. Bigz, Belgrade, 1993. Selection and epilogue by Radoslav Bratić: “The Writer as a Prometheus of His Heroes”. Notes by the selector about the author and this book. This unfinished novel shows the destiny of a genius, the architect Isidor Negovan. He is the last member of the family to which The Golden Fleece has been dedicated. The relationship of the leading character to the past leads him to suicide at the moment at the moment of erecting a grandiose monument, devoted to the Revolution. The events unfold in Belgrade from the time immediately after the end of the Second World War to Isidor’s death in 1964. The tale illustrates the destruction of his personality, in the time after the Revolution, as well as the problems involved in designing the monument. It can be seen how he gradually proceeds from his passion for architecture to a disenchantment in his work and a feeling that he has betrayed what is most important in art. At the end of the book are added Pekic’s commentary and a resume of the novel as the author had conceived it to be. Bigz, Belgrade, 1995. Added are notes about the author. In writing Atlantis, Pekic has noted his thoughts on tapes (from 1981 onwards) about his writings concerning the basic theme of the novel. It is a story about a story. These commentaries have been assembled and compiled by his spouse Ljiljana. They indicate Pekic’s reflections during the writing of Atlantis, as well as the observations and references he used in connection with the topic. The writer includes Dostoevsky’s and Berdjaev’s philosophies into his analysis, since they allowed him to create a global metaphor of human history and mankind in the novel. Bigz, Belgrade, 1996. Assembled by Ljiljana Pekic. Epilogue by Jasmina Lukic: ”Discovery of Atlantis, or On Approaching the Secret”. Also Ljiljana Pekic’s “Remarks by the Selector” and notes about the author. These are diaries and essays partly published in Pekic’s Selected Works and partly taken from tapes, where the writer has dictated regularly his thoughts and criticisms about various events and happenings. The time span of these commentaries stretches from 1954 to 1983. The material has been assembled and compiled by academician Predrag Palavestra. About his diaries Pekic says: “The Diary is as much an unreliable history as any other. The difference is that only in diaries do we lie to ourselves about ourselves, and in histories we lie to people about others. My diary is a sort of anthology of my existence, by many authors according to their choices”. Narodna knjiga, Belgrade, 1996. Selection and afterthoughts by Predrag Palavestra: “Remarks by the Selector”. A sort of diary about the secrets involved in conceiving The Golden Fleece, which Pekic started in 1983. The notes deal with his observations in connection with this phantasmagoria and have been dictated on tapes. It shows the way he constructed the seven volumes of the novel and talks about the characters of his protagonists. The material has been assembled and compiled by his spouse Ljiljana. The author unveils part of the literature which was needed to write the saga as well as explanations and commentaries associated with the theme. The reflections and topics concern mainly those that he had in preparing the sixth and the seventh volume. These notes are the first part of three volumes, which should be published. Part one, Bigz, Belgrade, 1997. Assembled by Ljiljana Pekic. Foreword by Jasmina Lukic: “The Golden Fleece between Myth and History”. Ljiljana Pekic: “Remarks by the Selector”, and notes about the author. This book was published on the fifth anniversary of the award “Borislav Pekic”, which is granted each year, for poetry, stories, and essays to competing pupils from all Belgrade gymnasiums. Assembled are all the awarded achievements for the period from 1994 to 1999, as well as texts by eminent writers and critics who wrote about Pekic, together with reminiscence from Pekic’s friends. Furthermore in this publication a fragment from The Years the Locusts Devoured is included, along with parts of his diaries as well as photographs from different periods of his life. The material has been assembled and compiled by Radoslav Bratic. Belgrade, 1999. Selected and compiled by Radoslav Bratic. Vladeta Janković has made a selection from the following three volumes: Letters from Abroad, New Letters from Abroad, Last Letters from Abroad, and has chosen 75 out of 150 essays which are the best in his opinion, and these are published here. They include witty and inventive observations about England and the English people, covering different subjects and events. As a part-time commentator for the BBC World Service, Serbo-Croat Section, London, (1986-1991) Pekić read his “Letters from London” every week and they were published afterwards. The letters were broadcast for listeners in Yugoslavia, therefore the author made numerous comparisons with the government, the country and the characteristics of the people in his fatherland in a humorous way. Pekić also says: “If it is good, our life loses a lot if it isn’t lived in the right place, but the right place is only the one where we were born and grew up. Of all the foreignness to which we are condemned, the most bearable is still our own”. Narodna knjiga, Belgrade, 2000. Selected by Vladeta Jankovic. These political commentaries are part of the author’s diaries from 1954 to 1958 and include a foreword by academician Nikola Milosevic. Pekic’s notes include a compendium of political systems as well as a specially elaborated tractate about the tactics in setting up a doctrine for an “aristocratic oligarchy”. (Oligarchy here doesn’t signify a party of aristocrats, but a principle of rule by the best.) The compendium deals with sociological, economic, politico-philosophical, historical, judicial, and political studies. He analyses the political doctrines of democracy, absolutism, monarchy, the oligarchical system, socialism, communism and the corporate system. Studies and criticism are based on sources from Marx, Engels, Lenin, Trotsky, and others. He tackles the French Revolution, the work of the Convent from Thermidor and later, and many other historical events from the near or distant past can be found in this book. His thoughts are very interesting about reformation of the schooling system, not only in technical terms, but also particularly in connection with the topics taught at school. He says: “The contemporary system of grades without selection is appropriate only for mediocrity. The intellect is neglected in favor of patience. The qualities of slaves are praised and rewarded. The school has become a big exercising ground for obedience”. He proposes that history incorporate sociology, economics and various doctrines, to be named POLITICS (in the Greek sense of the word). All art should be incorporated in ARTISTRY, and the maternal language should become SEMANTIC, which would later be transformed into PHILOSOPHY. He proposes only a few of the other disciplines: MATHEMATICS, PSYCHOLOGY and GYMNASTICS. Each of them would embrace the remaining activities for the future of humanity. The notes have been assembled and selected by Pekic’s spouse Ljiljana. Solaris, Novi Sad, 2001. Selected by Ljiljana Pekic. Foreword by Nikola Milosevic: “Borislav Pekic as a Political Thinker”. These philosophical studies are part of the author’s diaries from 1954 to 1958 with a foreword by Professor Nikola Milosević. Pekić’s philosophical deliberations, as well as his analysis and commentaries about some of the most important philosophical directions, ideas and systems throughout history, are treated. In this book his original ideas about “energialism” are discussed. It is a monistical philosophy that attempts to reconcile idealism with materialism, empiricists with metaphysicists, the comprehensive spirit of religion with solipsism, dialectic with logic, mathematics with poetry, democracy with aristocracy. Here he speaks of the history of the world as a history of energy, about politics as a repercussion of the philosophy of energialism. He explains the charter of energy – the definition of nothingness, of necessity, of energy as necessity. Pekić reveals the shortcomings in different areas of science, as well as a critique of philosophical doctrines and the misconceptions of the final contradiction’s idea, and also the genesis of God as the energy’s absolute self-knowledge. The notes have been assembled and selected by Pekić’s spouse Ljiljana. Solaris & Stylos, Novi Sad, 2001. Selected by Ljiljana Pekic. Foreword by Nikola Milosevic: “Borislav Pekic’s Philosophical Legacy”.